Get involved with Mary Kay. Spend lots of money. And make sure your husband never knows about it. That’s the Husband Unawareness Plan. This is one of the more sinister aspects of Mary Kay Cosmetics. Of course, this is an unofficial thing. Mary Kay Inc. will say they know nothing of it, and certainly don’t condone it. But the corporation profits from it. Oh please. 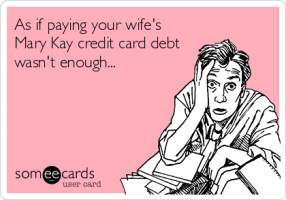 Mary Kay herself taught the Husband Unawareness Plan. I believe you are correct, Shay. Is this whole video available anywhere? This seems like a good way for a husband to become an ex-husband. As a husband, the discovery of this was very disturbing. They make it out to be this funny little joke on the husbands. It is nothing of the sort. It is dishonest and disrespectful. It is disgusting. I stumbled across this site and I’m amazed that people actually fall for this. Why would anyone spend that much on makeup that isn’t high end? All the people that decided to invest in Mary Kay to become a consultant must not be into beauty products. I have never seen a MUA use Mary Kay nor have I ever seen any successful beauty gurus on youtube use Mary Kay. Yet all these people decided to invest in a Mary Kay kit to sell product when they aren’t even beauty experts. I have never known anyone who uses mary kay or avon. I just cannot believe people are buying skin care that is probably doing more harm than good and at the same price point as Drunk Elephant and Sunday Riley. Just checked the Mary Kay website and a 6 pan eyeshadow palette costs $65. For less than $65 you can get Tarte, Too Faced, Urban Decay, ABH or save up $129 and get Natasha Denona which has 15 pans. I would personally be embarrassed to even pull out mary kay makeup in front of anyone. I would use drugstore makeup before mary kay, avon, etc. Mary Kay, Avon, Yonique etc. all seem to just be private labeled alibaba made in china products that you have no idea what is really in them. Even Morphe and Colourpop are better choices. exactly, estee lauder all the way, class, quality and sophistication, plus they have the number one selling foundation in north america. exactly. While getting my hair done last week a lady came in to ask my hairdresser if she could leave some MK business cards there at the salon. My hairdresser let her put them out since she is another stylist’s client. While she was there she made the claim that MK’s face wash brush was the exact same thing as the Clarisonic! My mouth dropped open and I just shook my head. And of course the speech about how they are #1 in skincare-at which I rolled my eyes. She sent me a icy stare and hurried out the door. All MK does is copy off of the companies that actually spends the $$ and does the research. MK can say whatever they want-they are way behind in the vitamin C, masks. etc. They’re trying to make their sheet masks look prestigious by charging $70 for 4. Everything you said is spot on accurate! I picked up a bunch of masks at Kohls for less than $2 each. I love them! Sephora and Ulta have a HUGE variety of brands out there. Even Sephora’s is $2/mask. So much more realistic! Without wanting to insult anyone, the first and foremost reason for me to never buy MK is the MK ladies themselves. I leaved through some Applause magazines and googled some Seminar pictures and all I see is women with ugly, clownesque make up on, tacky nails, horrible gaudy dresses, and I don’t know where they get their hair done but their hairdressers are either blind or hate their guts. Why would I take beauty advice or buy make-up from a person who lacks any kind of taste? And this is why I grew more and more embarrassed to be associated with a company like MK. The frumpy, outdated, and ego-driven appearances were too much to handle. When you’re talking to a customer, you talk abut HUP. But then there’s the opposite spiel in the recruitment pitch. That’s why when I joined them before, I was amazed that they said foundation is the last step of skincare, after moisturizer. Where is the sunscreen? And foundation is not skincare. They said you should wear it even at home. Talk about clogged pores!